Nurse numbers: an unhealthy state of affairs? Since May 2010, when the Coalition arrived in office, we have had a series of reports into where, how and when the NHS is 'failing' its patients. And while all our political parties agree that lapses in patient care are unacceptable, they disagree on who or what is to blame. The Labour party insists that the government has overseen the loss of thousands of nursing jobs since the election. According to Andy Burnham, the shadow Health Secretary, "All the experts are now telling the government to get a grip on staffing levels." 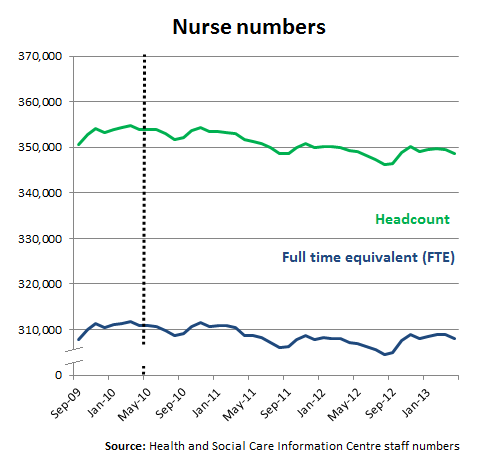 Since May 2010, the number of nurses has fallen - regardless of whether you're looking at the headcount or the number of Full Time Equivalent (FTE) nurses. The headcount figures do show, as Labour claim, that 5,269 nursing jobs have been lost under the current government. Using the Full Time Equivalent measure, the decrease has been smaller (2,854 posts). Labour argue that the Coalition have made "dangerous cuts to nursing posts". Not all of these will have been redundancies. The NHS is also struggling to recruit new nurses. The Royal College of Nurses notes that while fewer nurses are coming here to practice, there are also more NHS nurses leaving the country. The Safe Staffing Alliance wants a minimum of one nurse per eight patients on acute wards (with a ratio of 1:4 or 1:6 a better scenario). But while both the Francis report and the newly published Berwick report recommended that the NHS keeps track of staffing levels, neither prescribed a minimum nurse to patient ratio. However, while he didn't recommend this in his report, Sir Robert Francis has now suggested that the government might want to consider it as an option. He is quoted by the Health Service Journal as asking whether there ought to be "some sort of benchmark, which at least is a bit like a mortality rates — an alarm bell which should require at least questions to be asked about whether it is possible for a service to be safe". The government has so far not committed to imposing a minimum nurse to patient ratio. In response to Labour's accusation that it has overseen a drop in the number of nurses, the Coalition has pointed to its record on doctor numbers - since the last election, the NHS has employed an extra 4000 clinicians. Are half of NHS workers obese?